Health enthusiasts, members of the press, social media influencers and those simply wishing to switch to a more beautiful and fit lifestyle; attended the kick-off event for “Transformations—Beauty + Fitness,” the latest health and beauty campaign spearheaded by BFC Laboratories and Watsons Stores that seeks to help everyone achieve health and pulchritude through a sensible program of regular exercise, diet and most importantly, supplementation. Present to support the campaign were BFC stalwarts including, social media influencer, host, model and BFC Lab Athlete, Ryan Kolton; Bb. Pilipinas Universe 2012, host and actress, Ariella Arida; and actor and sports enthusiast, Gerald Anderson, who presented their experiences on how they incorporated health, fitness and beauty into their own busy lives and professional careers. Ryan Kolton for instance talked about how regular exercise workouts can further be improved by supplementing one’s diet with pre, intra and post-workout supplements. He singled out, the different Euphoriamaxx variants of BFC Laboratories (L-Arginine, Creatine, BCAA and Glutamine) as essential in providing extra energy, in developing muscles and in promoting muscle recovery. He likewise stressed the importance of weight management in transforming one’s physique through naturally-sourced fat- busters (L-Carnitine and Green Tea Extract) in Cosmo Body Dietary Supplement; and the elimination of toxins through the ingestion of additional fiber through Psyllium Fiber in Fibermaxx. Extract or GSE to help her correct dark spots and lighten her skin through Cosmo Skin GSE Dark Spots Corrector. Gerald Anderson likewise stressed the importance of supplementing with vitamin C, through Cosmo Cee. He noted that vitamin C has always been instrumental in fostering stronger immunity, adding that the addition of bioflavonoids in Cosmo gives him and added edge when it comes to the numerous sports activities he is into, as it lowers cholesterol and triglyceride levels. 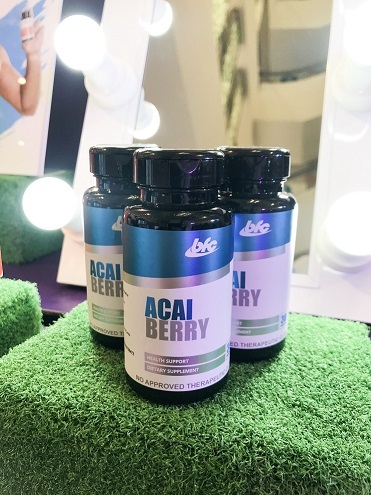 The event also served as the launch of BFC Laboratories’ newest diet supplement, BFC Lab Acai Berry. Made from the Acai Berry which is sourced from the Amazonian region of Brazil; BFC Lab Acai Berry promotes heart health, aids weight loss, promotes skin health, helps digestion; is an immune system booster, has anti-ageing effects, boosts energy and improves mental function. BFC Lab Acai Berry dietary supplement is now exlusively available at Watsons stores nationwide. The “Transformations Beauty + Fitness” event is a months-long celebration of health and beauty that will have numerous activations in various Watsons and SM Malls throughout the country. It will culminate in the a Big Event this October at SM Megamall, with even more health and beauty activities, celebrity guests and promotions in time for the holidays. For a complete list of Transformations activations and more information about the Culminating Event, log on to www.cosmo-skin.com or follow BFC Laboratories on Facebook and Instagram at @bfclab and @cosmoskin.